Have you ever had to choose between your favorite Reverend Nat’s cider and a convenient six-pack of something else? Do you prefer the quality and taste of a true craft cider but need a multipack for a party or simply your average Friday night? There’s no need to choose any longer. 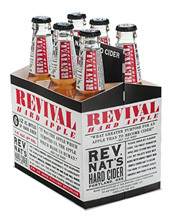 Reverend Nat’s flagship cider, Revival Hard Apple, is now available in a six-pack format! Initially available at select locations in Oregon and Washington, the new package will roll out in all of Reverend Nat’s markets in early 2016. Reverend Nat’s Revival Hard Apple is the company’s best-selling cider and was named the best cider in the country by Eater.com in June 2015. Revival is a medium-dry cider that is made using a blended fermentation of saison yeast, secret culture and 100% fresh pressed juice from Northwest grown apples. Mexican piloncillo sugar in the ferment adds a golden color and richness to the flavor without unnecessary sweetness. 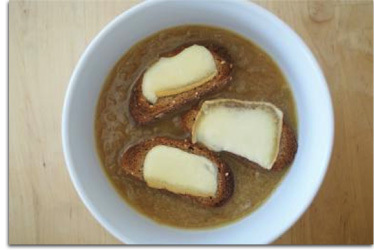 Backsweetened only with fresh apple juice, Revival is complex and sophisticated as well as fresh and approachable. Expect all the quality of Reverend Nat’s craft ciders in the new format. At Reverend Nat’s Hard Cider, they search the world for superior ingredients to handcraft the most unusual ciders that no one else will make. With unique products like the multiple-feremented Revival, dry-hopped Hallelujah Hopricot, and quinine-bittered Deliverance Ginger Tonic, the cidery is making cider in the creative spirit of beer geeks. To learn more, check out the website at ReverendNatsHardCider.com. Photo courtesy of Reverend Nat’s Hard Cider. 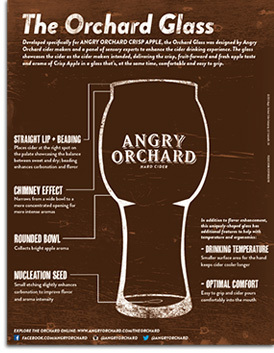 Angry Orchard announced a brand new glass designed just for hard cider: the Orchard Glass. 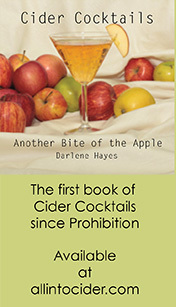 Cider is a unique beverage that walks a line somewhere between wine and beer. And while there are many glasses out there, developed to enhance the flavor of wine or craft beer, the cider makers at Angry Orchard couldn’t find a glass they felt did the same for craft cider. With cider having a renaissance here in the US, the cider makers wanted to give those discovering the drink the best cider drinking experience possible. The cider making team decided to enlist the help of several cider and sensory experts to create a new glass from scratch, specifically designed for the unique, fresh apple flavor profile of Angry Orchard’s most popular cider, Crisp Apple, made with culinary apples from Italy and traditional bittersweet cider apples from France. The end result of the project, the Orchard Glass, named for the cider maker’s new innovation orchard and cidery opening in the Hudson Valley of New York State later in 2015, enhances the cider’s crisp, fruit forward, fresh apple taste and aroma. For years, craft brewers have been adopting specific glassware for their beer to be served because they care about what they’re brewing and know the drinking experience doesn’t end once a beer leaves a brewery. The same holds true for cider, and the cider makers were passionate that cider deserved the same care and attention. To kick off the project, the cider makers drew initial sketches, tested more than 50 glass options with a vast variety of shapes and openings, and then had hand-blown samples made to test their ideas. A number of world-renowned sensory and cider experts drove into the process with Angry Orchard, including one of the world’s best cider makers and educators, Peter Mitchell of the Cider & Perry Academy in the UK; a leading sensory expert with more than 30 years of experience working with the global brewing industry, Roy Desrochers of Tufts University Sensory and Science Center, and Boston University Adjunct Professor Sandy Block, Master of Wine and Vice President of Beverage at Legal Sea Foods. The panel participated in tastings to evaluate the functional design features needed to best showcase the key flavor and aroma characteristics of the cider. In addition to flavor enhancement, this uniquely-shaped glass has additional features to help maintain the optimal temperature and also improve ergonomics. The Orchard Glass will be available at select bars and restaurants around the country that serve Angry Orchard and at the cidery in Walden, NY when it opens. 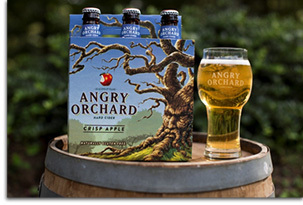 The glass is now available for purchase in a two-pack for $14.95 at Angry Orchard’s e-store: AngryOrchardStore.com. Photos courtesy of Angry Orchard Cider Company. 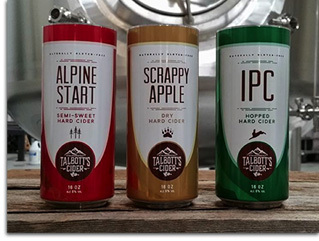 Talbott’s Cider Company, a new cidery based out of Grand Valley, Colorado, has recently opened its doors to the public offering three ciders in its portfolio – Alpine Start, IPC and Scrappy Apple. For decades the Talbott family has owned and run Talbott Farms which has been continuously expanding since it opened. The family introduced their first cider mill in 1983 and as production increased in the 1990s, the family built a larger cider mill that currently meets production demands today for the Talbott Mountain Gold apple juice that has been enjoyed locally for decades. Charles Talbott and Christopher Leader, avid homebrewers, saw so much potential for the farm to do more with its apples that they decided to start fermenting their apple juice this year and expand into the hard cider industry. Scrappy Apple: Also a 6% ABV cider, this cider speaks to the traditionalist in all of us. 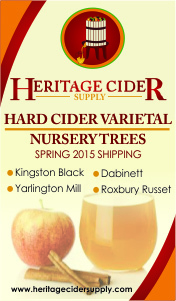 It is a very clean, dry and tart cider that the cider makers wanted to showcase the farm’s fresh apples. Talbott’s Cider is set to be available in local liquor stores in Grand Valley, CO shortly in four-packs of 16-ounce cans priced between $8-$10. In the coming months, six- and twelve-packs of 12-ounce cans will be available as well. For more information, please visit TalbottsCiderCo.com. Cascade Wine Services, which has been providing highly efficient mobile crossflow filtration services to Northwest wineries since 2009, has embraced the local cider industry as well, offering an in-demand but rare service to a burgeoning field. This filtration service that Cascade Wine Services offers allows wine makers and cider makers alike to reduce losses associated with conventional technology but reap the benefits of current technology without having to invest in capital-intensive equipment. Most large cider houses produce enough cider to invest in on-site filtration equipment, but for smaller businesses and start-ups, mobile filtration is an economic solution. 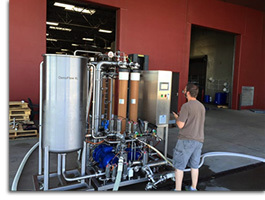 To enhance its filtration services, Cascade Wine Services recently purchased reverse osmosis (RO) equipment that will be available to clients in the next month. RO takes out impurities at the molecular level; it’s a huge benefit to the wine industry, but also works with juice concentration. Cascade Wine Services, which began working with cider in 2011, filtered 17,000 gallons its first year, the company is on track to filter 430,000 gallons by the end of 2015. For additional information or to request Cascade Wine Services, please visit their website at CascadeWineServices.com. Photo courtesy of Cascade Wine Services. Many wine and cider aficionados may know of the Applewood Vineyards and Naked Flock Hard Cider dynamic duo, located in Warwick, NY. With Applewood Vineyards releasing fantastic wine every year, much of which is pre-purchased before it even goes into bottles and Naked Flock putting out some exceptional, clean, and great tasting hard cider. But something else is causing a stir at Applewood Vineyards right now and it’s not the wine or cider; but it still comes from apples! Applewood Vineyards, alongside Naked Flock Cidery, is distilling their first vodka! Introducing, Applewood Apple Vodka, the first spirit released in a new growing line of spirits from the vineyard’s distillery called Applewood Distillery. Applewood Vodka is different in that it is 100% distilled from apples; this is where Naked Flock Cidery jumps in with their expertise in apple blending and their ability to always use the freshest, best tasting apples. This vodka is made from the same local New York State Apples that Naked Flock uses to make their delicious cider. Since apples are sweeter than many other bases used for distilling vodka such as potatoes or grain, it gives Applewood Apple Vodka signature vanilla and caramel notes on the palate combined with a fruity nose. This vodka is hitting notes that other vodkas only dream about with a subtle palette that is more likely to be found in a well-aged whiskey then in vodka. All of the complex flavors leave an essence in the background so as to not steal away from the clean vodka taste that drinkers have come to appreciate. It finishes nice and smooth as all good vodka should, leaving you wanting more. This vodka is sold in 750mL bottles but is very hard to find outside of New York state. For as smooth as it is, while still remaining 80 proof, this vodka is great in a mixed drink, straight up, or as a shot. While Applewood Apple Vodka is the only spirit available on the market from the company, Applewood Vineyards is planning on releasing a full line of spirits in the near future. The full line will all be crafted in the same “tree to bottle” fashion as the rest of Applewood’s offerings and will definitely boast the same attention to detail and high standards that all Applewood and Naked Flock products have come to be known for. While it may be tough to get a bottle, a quick trip to Applewood Vineyards and Naked Flock Cidery will give drinkers the ability to sample the vodka as it will be available in the tasting room along with the rest of their finely crafted beverages. The tasting room is located at 82 Four Corners Road in Warwick, NY. 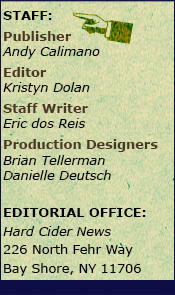 For more information on Applewood Vineyards and Naked Flock Hard Cider, please visit ApplewoodWinery.com and be on the lookout for Applewood Apple Vodka. Photo courtesy of Applewood Vineyards. 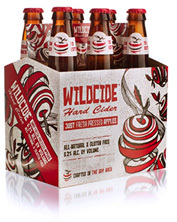 Aurum Cider Co., the newest venture from Gordon Biersch co-founder, Dan Gordon, announced the brand’s first commercially available product, WILDCIDE, a 6.2% ABV branch-to-bottle cider with one ingredient – apples. The not-from-concentrate juice is flash-pasteurized, meaning there’s no need to add sulfites to the product. 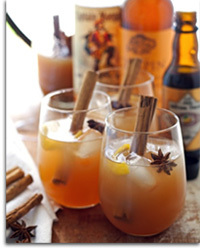 It’s also gluten-free, making it an attractive option for drinkers with dietary restrictions. WILDCIDE’s dry, tart qualities make it perfect for pairing with food. From hearty grilled cheese sandwiches to pork belly, brisket, burgers and more. WILDCIDE stands strong and matches the flavor bite for bite, sip by sip. WILDCIDE is already available at off-premise locations where Gordon Biersch products are sold in six-pack 12-ounce bottles for a suggested retail price of $9.99 or 22-ounce bottles for a suggested retail price of $4.99. For additional information, please visit TheWILDCIDE.com. Photos courtesy of Aurum Cider Co.